One thing I might do differently here is simply get a different cheddar. 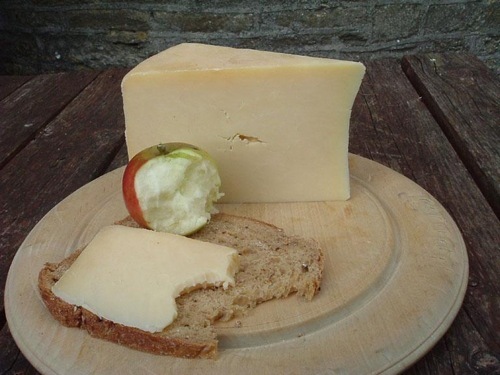 While Keen's is certainly one of the world's best, you can do even better with Montgomery's cheddar, a cheese that is, in Max McCalman's words, the standard-bearer for all cheddars. In fact Keen's and Montgomery's are made down the block from one another from cows of the same breed grazing on grass in the same terroir, but they are located in separate watersheds. And that, according to McCalman, is what accounts for the difference in these two cheeses. Amazing. You might want to add a beverage here, perhaps a crisp English hard cider (overkill? ), or maybe a premium cold sake. Sake, you say? Well last night I went to a sake and and cheese pairing at Artisanal, and I was blown away with how well the Montgomery cheddar paired with each and every sake in the tasting. But don't take my word for it. Go ahead and try it! And, as always, let us know what you think.